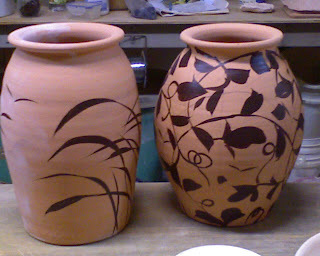 The jar on the left is pictorial while the jar on the right is a more all-over pattern. But both employ the "Hallmark" gull/bird! I'm not sure what it is about that flying bird motif, but I let out little chuckle every time I paint it. It's good to keep a sense of humor while I do this critical ceramic work.